Thank you for letting us be part of your event! We are so honoured to work such lovely people on amazing events from wedding set ups and coordinating to fundraisers, anniversaries, grand openings, birthdays and more. Below you will find our review form so you can let us know how we did or see reviews from our past clients. 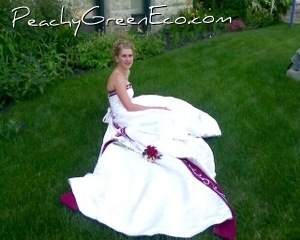 Can’t say enough great things about Robyn at Peachy Green Events. She made my decor vision a reality and having her as the day of coordinator for my wedding day was a decision I’m so glad I made. I got to have a beautiful wedding and enjoy it stress free thanks to her and her assistant! Robyn is so lovely and excellent at what she does. The first time I used her services I needed to create a zero waste, chic company picnic. I found a couple of pictures that represented what I wanted it to look/feel like and asked her to run with it. She was bang on with the decorations, food, games, etc. I was able to simply show up and everything set up looking better then I could have imagined. I called her again when we were sponsoring a hole during a golf tournament and wondered what kind of ideas she had... that's when she showed me The Side Car. So cool!!! We decided on a retro 70's campsite theme (Robyn got her hands on some vintage lawn chairs!) and served drinks and pizza buns from the side car. The feedback we received was that our sponsored hole was the most original people had seen in a while. Thank you Robyn!! Amazing job with our wedding! If I could give more than 5 stars, I would do so in a heart beat. From the moment my wife and I first met Robyn, we knew we had made the right choice, and she proved us right! Throughout our wedding planning process, there were so many little details that we never even considered, and they all came together in perfect fashion to make our wedding a stunning day; both in terms of decor and coordinating. I appreciated that Robyn was such an easy going, prompt, and thoughtful person, where by the end of the experience, it felt like it was a friend we had hired, rather than just another vendor. The communication, sharing of ideas, and always being available to meet and discuss any ideas or thoughts was top notch. The icing on the cake was how easy and stress free Robyn and her wonderful husband made our actual wedding day, from the rehearsal, to the coordinating throughout the day, and also the tear down to make sure everything wound up where, and with who it belonged. Please take my advice and hire Peachy Green for your events... I promise you will thank me and all the other glowing reviews! I rented several items from Robyn for my wedding and she was so easy to work with. I added to my order several times and she was really easy-going about it and made at least one aspect of the wedding pretty stress-free! Made my wedding day peaceful and relaxing! It was so easy working with Peachy Green Events, Robyn is a friendly and calm presence and it was very simple to organize the drop-off/set-up/tear-down with her. By having her set-up and tear down all of my wedding décor, it allowed me and my loved ones peace of mind and a truly enjoyable wedding day! I dropped off the décor the week before and forgot about it-I knew it was taken care of! She went above and beyond making a very vague idea that I had into a beautifully decorated room. She accommodated all of my requests without hesitation. She was on time and answered emails promptly. I would love to have a reason to use her services again! Loved working with Peachy Green! It was an absolutely pleasure working with Peachy Green. I live in Calgary but got married in Winnipeg, and Robyn was so accommodating. I had a general idea of what I was looking for, but she offered many suggestions on what would look best based on her experience. When I was in town, Robyn was more than happy to meet with me to go over the details and answer my many questions. She was also very flexible when I wanted to add items or change the set up slightly. 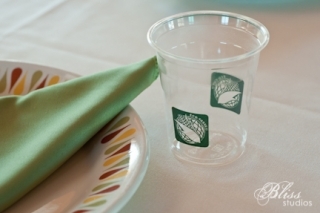 The prices are fantastic, and having the Peachy Green team handle all the set up made the wedding day so much more relaxed. I would definitely recommend Peachy Green! Robyn and the staff at Peachy Green were such a pleasure to work with. They set up the decor just like I imagined it to be. It was a relief to be able to walk away knowing it was being done right so I could get ready for my wedding. I recommend them to anyone getting married, the last thing you want to do on your wedding day is set up centre pieces in the heat.Thank you Peachy Green! Robyn make you feel at ease and relaxed when she coordinates. Hiring her took so much stress off of us and our families for our wedding day. Her eye for decorating is amazing too, we trusted her to make the venue look amazing and she did! Would hire her again for any event. If you take this opportunity to get to know Robyn, a 5 star rating wouldn’t be surprising! Robyn isn’t just eco-conscious by nature, she is also considerate by nature. Robyn was conscious of all the details-her “eyes are on the bride” in ways I didn’t expect. Key moment: Robyn was the person who noticed a revealing puckering of my wedding dress, which she managed to fix before I stepped out to meet guests! The best part was she did it calmly, which made all the difference on this emotional day. Every step of the way, Robyn was there to ensure the wedding weekend at the lake went perfectly. She even managed to produce a bottle of champagne we were sure we out of, so we could toast with mimosas the day we were leaving! Thank you for the rental items. I’m so happy I found you and didn’t have to spend so much money buying all of our decorations. You made my wedding look exactly like I had dreamed. I have attended 2 events in the last 12 months that Robyn has planned and coordinated – a 65th birthday celebration/retirement farewell and a wedding social. In all instances, she has been extremely organized, pays attention to detail, plans well ahead, delegates where and when necessary and has everything documented for the special event, so that everyone involved knows what and when everything takes place.. She is also very adaptable and creative should anything not transpire as originally planned. Her manner is considerate and respectful of her clients’ wishes. I have no hesitation in recommending her to plan a variety of events. I am very happy with my decision to use you guys for styling! As soon as I saw your booth at the wedding show, I knew we would be on the same page. It seems we have similar taste in aesthetic. 🙂 … Thank you for being so understanding… You are making this whole process so painless for me. I don’t even know where to begin or how to thank you for EVERYTHING! What started as planning (& you making everything happen) has turned into such a cherished friendship. You are some of my/our favourite people EVER. After being to a few events Peachy Green has planned I wish we had hired a coordinator for our wedding. It’s amazing how many stressful situations come up on your wedding day and in the weeks leading up to it. 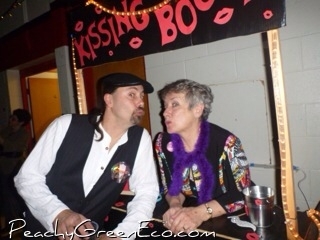 If we have another big event we will hire Peachy Green without hesitation. All of the rental items were packaged and ready to go when we arrived to pick them up. Even when we discovered there was 1 small item missing Robyn offered to drive down and hand deliver it herself. I was so busy enjoying the event that I didn’t even realize that it had been planned, or that there was a venue or service providers! Robyn’s professionalism and attention to detail ensured that the event itself was invisible, which allowed the people present to focus on enjoying themselves and building relationships. Thanks! It was so well planned that it made it a free flowing event that lasted all weekend. ….when you have a big event going on like a wedding sometimes you forget the little things like a pen to sign your official papers, good thing that Robyn from Peachy Green was around, she not only pulled a pen from her purse when we needed it, but later at our photo shoot had touch up lipstick for the bridal party. Talk about being prepared! It made our day stress free to know someone else was taking care of the little things. Thanks again! Best social I have ever been to! Normally I just go to support friends and expect the same thing as the last one but this one was awesome. The food wasn’t the classic social food, there was live entertainment and different parts of the building had different things going on so we weren’t all crowded in a dark room with loud music. Peachy Green was the definition of professionalism. Took care of everything, even all my anxiosity. 🙂 would definatly recommend to anyone planning their next event. Every time I went to make sure something was being done Robyn had already taken care of it. Thank you doesn’t even cover it, thank you for helping plan the wedding, for marrying us and for being such amazing people. Your calm, willingness to pitch in and organization are what made this day possible. You rock!!! We were so pleased to have Peachy Green Events help us plan our wedding social. They had great eco options for us and great ideas right down to the food selection so we didn’t have the same old social as everyone else. Not to mention we made a ton of money to help pay for our wedding, thanks!